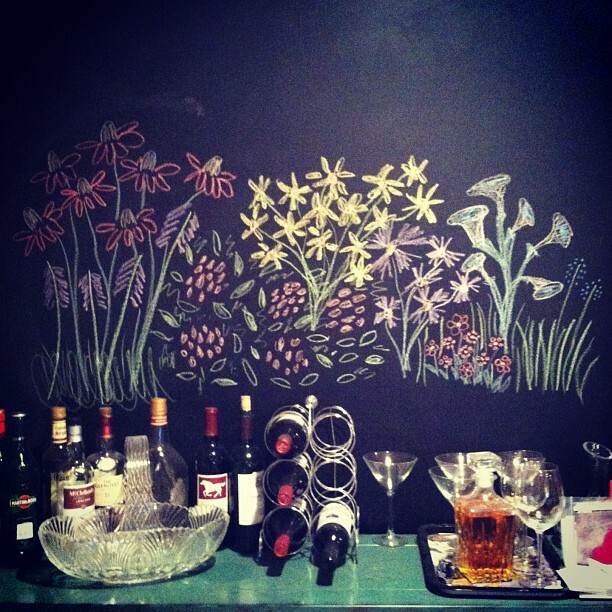 You may recall we have a chalkboard wall in our living room. Above is an Instagram shot from last night after Johnnie and I spent a few minutes doodling over the weekend. Usually it's covered in scribbles from our collaborative projects. (She likes when I write out the ABCs so she can color over them. "Draw an H, mama... Okay stop! My turn!" Scribblescribblescribble... "I did that myself!" she says.) But a glorious four-day weekend gave me ample time to get a little fancier. A rainy afternoon called for happy, colorful flowers. Side note: Please pardon my limited knowledge of plant biology. Some of these flowers are made up, and I don't know what kind of leaves the others have. Another side note: Looking at this photo, I realized you might think we are total alcoholics. Not the case, I promise. We do enjoy good wine and a nice bottle of Samuel Smith Nut Brown Ale now and again, but most of the bottles of hard liquor are leftovers from parties and gifts and haven't been touched in ages. Does alcohol go bad? Maybe it's time for a purge. I kind of want to put a little desk and play area in this spot for J-wow anyway. Anyone thirsty? Okay, back to the chalkboard. I love this thing, even after several years of living with it. It's not as dusty as I thought it would be, and a quick spray with white vinegar allows me to erase past drawings without any streaking or residue. Best of all, Johnnie loves it too. She's at an age now (she'll be TWO next month, and she'll tell you if you ask!) when drawing and coloring are more than just a passing fancy, and she's willing to actually invest a few quiet minutes in her projects. Crayons, chalk, AquaDoodle, ink pen, watercolor -- she's tried them all now and loves to make her mark. Doodling with her is one of my favorite things. She's a tough critic though. I drew a car the other day and she said, "Oh, it's a cloud!" Good thing she's giving me lots of opportunity to brush up on my drawing skills.